I promise to make a post about it so here goes. Trust me I had to struggle with this post as I just can't seem to find any strength to type anything. I'm more than happy to have shared few moments with the children at Cebu City Medical Center's Pediatrics...plus the fact that I'm still not so over with one event I saw while I was there. First off I don't have any better photos to show as I did not go there ready to document the said activity. As most of you noticed I have stopped writing posts about my outreach programs. I don't really have any reasons for that though. Anyway, when we got home the IT Guy told me that in between his breaks (since he was helping out most of the time!) 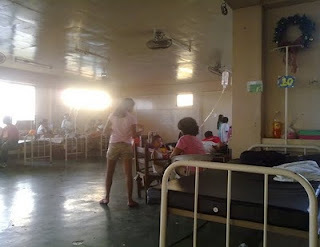 he was able to take some photos in some areas of the Pedia Ward. So here we are in action! 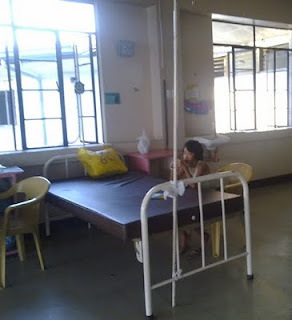 The Pedia Ward is located at the ground floor of the hospital and there were about 60 children there, that includes the Pedia ICU and they have an extension at the third floor where there were about 12 children. This is the one on the third floor. 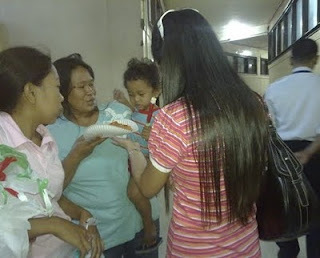 Here is my SIL giving candies and biscuits to the children. I had just to ask how come this child is alone...I was glad to know she's to check out and the parent was just checking with the nurses downstairs. 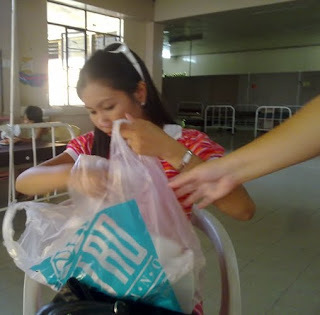 Here is Mariposa putting all her trash in one bag. Cleanliness is next to godliness so they say! The scene I left downstairs wasn't quite the same when I got back. The four month old baby who was in manual respirator (they call it bagging) was being pumped by the nurse. I could tell it wasn't good and I was standing there helpless seeing the baby go. I couldn't understand why we had to end the day with that. When I first stepped into the Pedia Ward the first thing I asked was what happened to her. The one who was doing the bagging told me that she had a cough. I had to ask the IT Guy how come she wasn't in normal oxygen, he just looked at me and said because she may not be capable to do it on her own. I know deep inside that once a patient is in respirator it means that patient is in critical condition, it just didn't dawn to me that, that child was in critical condition. I went to her Mom before going upstairs and told them I pray they can go home soon. It never occurred to me that they will go home sad. While I stand there looking at the nurses and the doctor trying to revive the baby, I kept asking people and myself what can I do. What do they need. Nothing. They needed the baby to respond first. I was standing there wishing one could share their lifetime with someone in an instance. I would gladly give some of my years to that child. It's just awful. I couldn't believe a child could die because of a cough. I couldn't believe how could parents wait for a simple cough to complicate before rushing them to the hospital. That baby I learned was just brought there on that day. Early that day another baby died because of the same illness. What in the world is going on? I want to stop this post as I am just too overwhelmed with a lot of things. I know I can only do so much, and I always wish I can do more but every time I struggle to do more for people I see how helpless I am and it hurts. I pray for God's hand to rest on the shoulder of the family of that baby who's with the angels now. 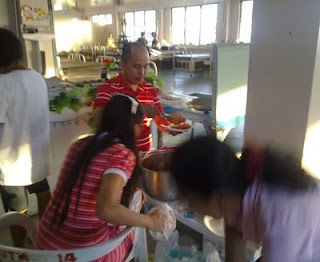 I also pray that the children there get better soon so they can spend New Year's eve at home. May God bless all the little children in world.